Currently O365 seems to be dead in EMEA. The great thing is: the Outlook Client doesn’t start at all anymore. Otherwise you could at least have worked in cached mode. I regularly visit your blog and am amazed that there is still nothing there regarding Office 365. Our whole company (write at the moment with my private GMX address) is paralyzed and also the address https://outlook.office365.com/ doesn’t work. 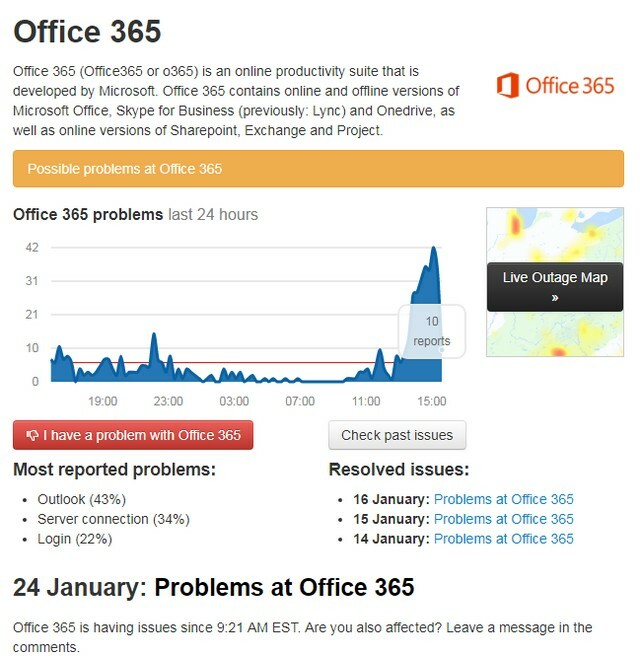 Of course it’s great when a complete company faces an outage of Office365.com. Suddenly people can’t work anymore. I can’t test it, because I don’t have an Office365.com account. The Office status page reports everything is ok. The I checked Downdetector, which reports issues with with Office365since 10:00 am (see screenshot above). Microsoft has a Status page on twitter. The Register has also an article about this outage. Thanks to all blog readers for their hints and feedback. First it looked like Microsoft got the problem under control that night. Blog reader Davide R. wrote me today by mail (thanks for the update) that the mail delivery works again. Since 10:00 pm (European time) we are finally back in Outlook from Switzerland, sending mails is not possible yet, but that should only be a question of time. All mails from today arrived with time 21:00 or later, at least no data loss. Microsoft has published an update of the status (Davide was kind enough to send it to me). 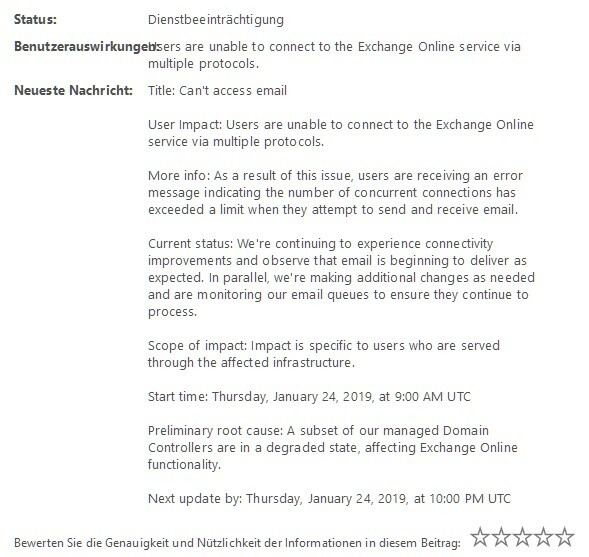 According to the status shown above, affected users had no access to Exchange Online and probably received a message that the number of allowed connections had been exceeded as soon as e-mails were to be received or sent. The bottom line is a failure of about 12:00 hours – not good for Microsoft. Meanwhile, new reports are flooding in that the malfunction is occurring again or even affects other products. In a comment German blog reader Stefan informed me that Microsoft teams are dead today (01/25/2019). And blog reader Davide has new malfunctions since 10:00 am. Also some comments I received after I’ve published an article at German news site heise.de indicating a new failure since 10:20 am (01/25/2019). This entry was posted in Cloud, issue and tagged issue, Office365.com. Bookmark the permalink.